Students will firm their grasp of reading and writing skills. Through books like Gulliver’s Travels, they will learn how to identify central themes, extract relevant information, and even do their own creative writing. In 9th grades, students will study number systems, algebra, geometry, coordinate geometry, mensuration, statistics, and probability. In 10th grade, students will add on trigonometry. 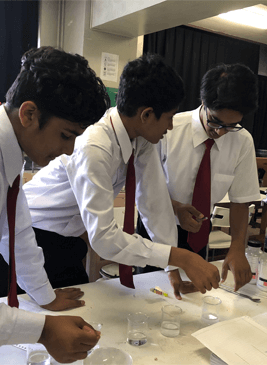 At the senior secondary level, science becomes more abstraction and quantitative learning. The curriculum is based on six themes that include Food, Materials, The World of the Living, How Things Work, Moving Things, People and Ideas, Natural Phenomenon, and Natural Resources. It is expected that discussions of Physics, Chemistry and Biology organically occur from the six themes. Social Science is compulsory up till the secondary school level. The curriculum draws mainly from Geography, History, Political Science, and Economics. Some elements of Sociology and Commerce are also included. Units include India and the Contemporary World, Contemporary India, Democratic Politics, Economics, and Disaster Management. IISJ currently offers French, Hindi, and Japanese.